Last week on the blog we revealed the tenth of our updated Season 4 model cards, Esters, the Ferocious Matriarch of the Brewer’s Guild. 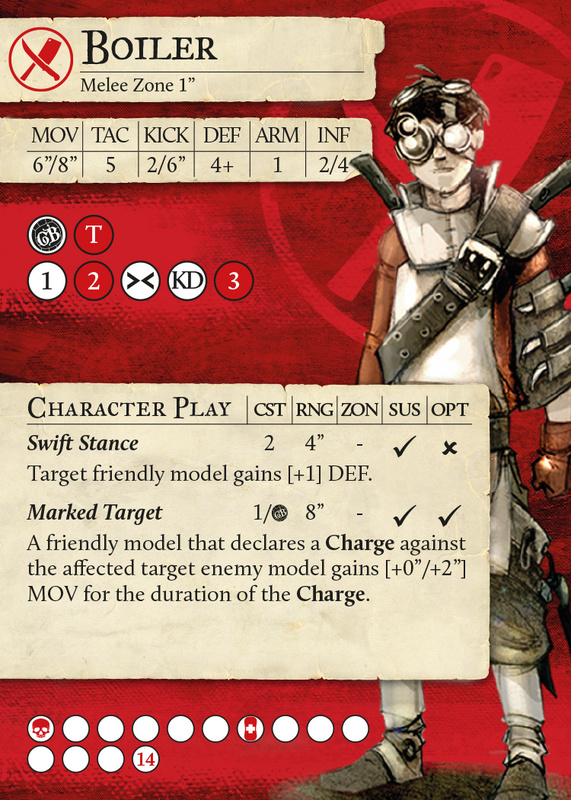 Today we’ll be continuing with our model card reveals with a look at the Season 4 card for the Apprentice of the Butcher’s Guild, Boiler. As we mentioned on last week’s blog, one of the first things we did when we started the development of Season 4 was to take a look at the intended playstyle for every Guild as a whole, and then each model individually. This process helped us to identify not only which models needed to change, but also by how much and with what purpose in mind. These objectives were in addition to overall aims such as reducing complexity and tweaking game balance. The Butcher’s Guild were commonly viewed as one of the weaker teams in the game for most of Season 3. Being a recommended ‘starter Guild’, they are very simple to pick up and play with, however this can also make them easier to counter. We knew quite early on that our objective for the Butcher’s Guild overall would be to maintain their simplicity whilst also raising their power level ever so slightly. One big weakness of simpler direct damage teams like the Butcher’s Guild is often control. Quite simply, if the big scary Butcher with a huge stack of influence can never get into a position to spend all that influence on making attacks, then the Butchers won’t be to score VP particularly easily. From a design perspective, one of the ways to solve this is to add lots of extra abilities specifically designed to counter these kinds of problems. The reason we didn’t do this is because that method is a slippery slope to dramatically increasing model and team complexity. What we did instead was target two specific areas: ‘tempo’ and ‘efficiency’. That is, the capacity for the team to move more quickly, and apply more damage per attack. The result is that even if the Butchers are being prevented from making some of their attacks, the ones that manage to hit the opponent will still do enough damage that the Butchers can have much more of a chance of winning the game. This is where Boiler comes in. This Pork Is So Raw, It’s Still Singing ‘Hakuna Matata’! Boiler has a couple of subtle changes, and one big change. But overall, the main reason we chose Boiler to show off in this blog is that he is a good indication of what we’re doing with the Butchers generally. He also leads very nicely into some topics we’ll get onto a little later… but for now, let’s take a look at Boiler himself. Getting the simple stuff out of the way first, all of Boiler’s stats, melee zone, and health points all stayed exactly the same as they were in S3. This is true for most of the Butcher’s Guild, their stat lines are actually fairly solid so there hasn’t been a lot of change there. Boiler’s playbook has had a few small, but significant changes. While the Butchers will never be as proficient at knocking enemies down as the Brewers or the Blacksmiths, the Butchers still need to use the knocked down condition to help facilitate their take-out focused playstyle. Previously, the Butcher’s access to the knocked down condition wasn’t quite as good as it needed to be. So, we’ve shifted it down by one column on Boiler’s playbook. The other place we tweaked this was on Tenderiser, who increased from TAC 5 to TAC 6, while his knockdown result stayed where it is on the third column. The second change we made to Boiler’s playbook is a more common change throughout the Butchers, and that is an increase to his top end damage results. Boiler’s momentous 3 damage has shifted down from the fifth to the fourth column, and he has gained a new momentous 4 damage result on his fifth column. We’ve already seen in recent blogs that we’ve been reevaluating playbook damage for certain Guilds such as the Farmers and the Blacksmiths. We also reviewed the damage on Butcher playbooks and decided that we could apply some of the lessons learned where appropriate. This has resulted in a few changes like this one to Boiler. Similar changes have been made to Boar, who now has a Momentous 6 damage result on his seventh column, and Tenderiser, who now has TAC 6, a six-column playbook, and a new momentous 5 damage result on that sixth column. Moving onto Boiler’s character plays, we hit the one big change which is the removal of Swift Stance. It’s a big one, no doubt, but we have our reasons. Butchers are the ‘glass cannon’ Guild. Massive damage, high speed, low resilience. Being able to have a DEF 6+ Captain, or DEF 5+ and ARM 2 Squaddies is not something which fits this design. To this end, Tough Skin has also been taken off Captain Ox (and replaced with a standard ARM stat of 2 on that model). However, we have increased the Butcher’s offensive output in terms of how much damage they do, as well as their mobility which will help them chase enemies down and apply that damage. With all this in mind, we replaced Swift Stance with a new character play called Axe Throw. Axe Throw is beautiful in its glorious simplicity. Short ranged and high damage, Axe Throw benefits from Crucial Artery, so if used at the end of a turn that’s a guaranteed 6 damage to an enemy model. Axe Throw also benefits from the huge variety of damage buffs available to the Butchers. Under The Owner, Get ‘Em Lads, and Tooled Up, Axe Throw will do 6 damage with a possible 3 more from the bleed condition, ouch! Axe Throw also adds another nice tool to a Fillet team’s arsenal by being able to apply damage and bleed to enemy models from range. This means that Fillet will have more opportunities to charge enemy models while benefiting from Smell Blood without having to apply the bleed condition herself. Models like Shank will also have more opportunities to benefit from Damaged Target. Boiler’s second character play, Marked Target, has also had a few small changes which help it out quite a lot. Firstly, it is no longer a ‘once per turn’ character play. If Boiler misses his Marked Target, he can just spend more influence and try it again or even apply Marked Target to multiple enemies. Also, Marked Target’s range has increased from 8” to 10”, which is just generally useful for a character play for which the entire purpose is to extend the charge range of Boiler and his teammates. If you count the ways that Axe Throw can trigger the extended charge ranges of models like Fillet and Shank, in addition to Marked Target, Boiler has two different ways of extending the charge ranges of his team mates. It is through abilities like this, rather than relying on increasing their defensive stats, that the Butchers will be able to combat teams that have previously been able to counter the Butcher’s Guild tactics. Yeah, not a lot to see here. Well, technically nothing, because nothing has changed. The back of Boiler’s card was already great. If you ever get Boiler into a position where he is benefiting from Assist in addition to any other damage buff, of which there are many in the Butcher’s Guild, he will handily turn whatever he attacks into bloody pulp. Crucial Artery is thematic and generally awesome, as is Anatomical Precision. All good really. So, what else have we got to talk about? Well, that’s quite something! Not only do we know that the Season 4 Butchers have more options for charging further across the table at the enemy team, they ALSO have the option to make charges cost 1 instead of 2 influence for as many models as they can fit within the aura. Imagine setting up a first turn with Fillet, using Get It While It’s Hot on her, with Shank stood nearby, Boiler has used Marked Target and Axe Throw on someone. Both Shank and Fillet could charge at something 14” away and reach it, for 1 influence each before laying the smacketh down on whatever they reach. Have we got time for something else? Yeah, lets do one more! This is the brand new character trait that Princess has in Season 4 that should make people think twice about taking a parting blow from her! That’s all for today folks. We hope you enjoyed today’s reveal of the all new Boiler. Join us next time to see the reveal of the Season 4 player card Smoke, Captain of the Alchemist’s Guild, the Breakthrough.